I've had a 4GB plan for several years now and went over maybe once or twice this whole time. Then out of nowhere last month I started going over my data well before halfway through the billing cycle. I looked up my data usage and my Message+ app had used nearly 4GB of data. By the end of the billing cycle it had used 7GB! 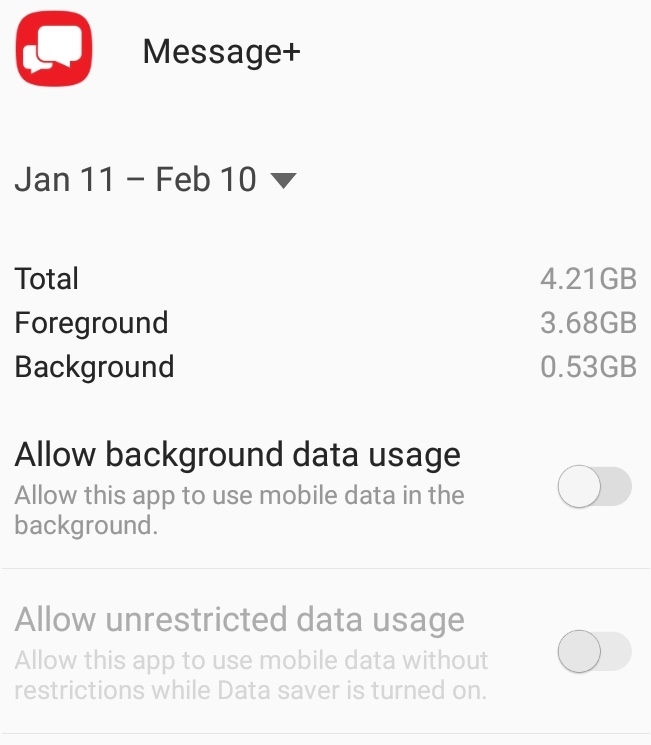 In past billing cycles I can see that on average the Message+ app used not even 0.1GB of data. I haven't made any changes in the app or to the settings on my phone. I haven't done anything new recently and can't figure out what is causing it to use so much data. I've changed the settings on my Galaxy S7 (not a new phone, had it for almost 2 years) to restrict background data although the majority of the data being used by this app is displayed as foreground data. Any insight would be greatly appreciated! 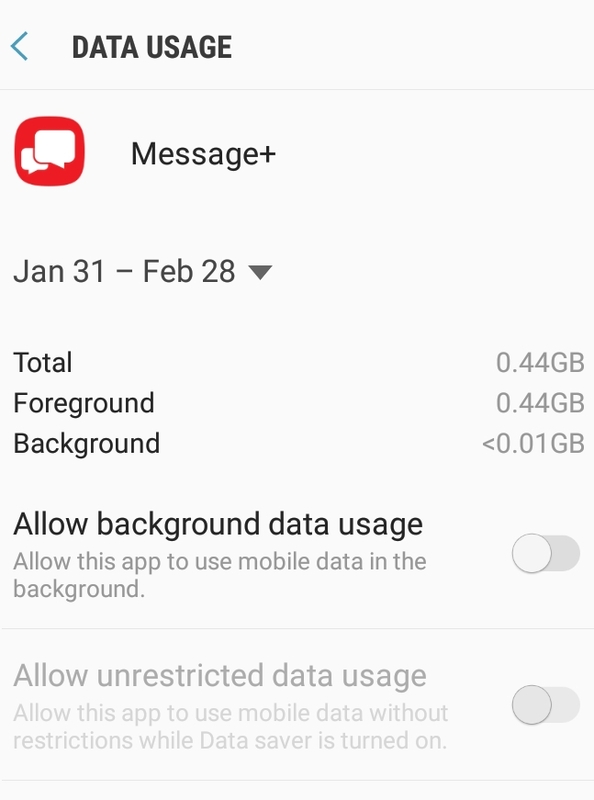 Re: Message+ app using all of my data! There is a solution if you want to continue to use the Verizon Message+ App. You have to clear the app data and cache. Doing this will require you to log back in to Verizon Message+ after clearing the data and it will reset all your customization settings to default, but your messages will be restored when you login back in to your account. If you try this fix, then I recommend looking through your settings and take note of the options you've selected so you can revert them afterward. 4) Click on "Clear Data"
5) Click on "Clear Cache"
I did this fix over a month ago and immediately saw the Message+ data usage return to normal. However, I would still keep an eye on your data usage in case it starts to drain data again since I don't know what initially caused the app to start using excessive data. Thank you for reaching out to us about this. Higher data usage can certainly be a concern. If you have increasingly used the application over time data usage can increase. Sending picture message through the application can also lead to higher usage. I have this exact same issue. I also restricted background data in an attempt to stop Message+ from using all my data, but it just started using foreground data. It used over 400MB yesterday morning while it was just sitting on my desk at work. It's used over 4GB overall this billing cycle and in past months it's used less than 100MB. Here are screenshots of the most recent data usage this bill cycling compared to the previous month. That's terrible but I'm relieved I'm not the only one this is happening to. I ended up disabling the app and reverting back to the messaging app that came with my phone and my data usage miraculously stopped climbing. I'm on the verge of leaving Verizon anyways since this isn't the first issue I've encountered with them. I was also relieved to see that I was not the only person this was happening too. Thanks for making the original post. I did the same thing, disabled the Verizon Messaging app and reverted back to the default. I left a negative review on the app store for it as well to warn other people and hopefully get Verizon to acknowledge the issue. I don't know what the app could possibly be doing to use THAT much data though or why it just suddenly started doing it. It is important that you get the most out of your service with us. That the performance you get out of Verizon Messages+. Can you describe what kind of messages you are sending and receiving, and whether you are using Verizon Messages + to send messages though messaging services such as Glympse? Picture and Video Messages under 5MB should not be billed for Data. Follow us on TWITTER @VZWSupport If my response answered your question please click the Correct Answer button under my response. This ensures others can benefit from our conversation. Thanks in advance for your help with this! I have been using Verizon Message+ app for years and have been sending the same kind of text messages which mostly consistent of basic text and occasional website link sharing, picture attachments, and group messaging. I do not use the messaging app for any messaging services. I haven't done anything differently recently than I have in the past. I didn't even use the app for a whole day and My Verizon data hub said it used almost half a GB of data! I have since disabled the app and my data usage has stopped increasing excessively. 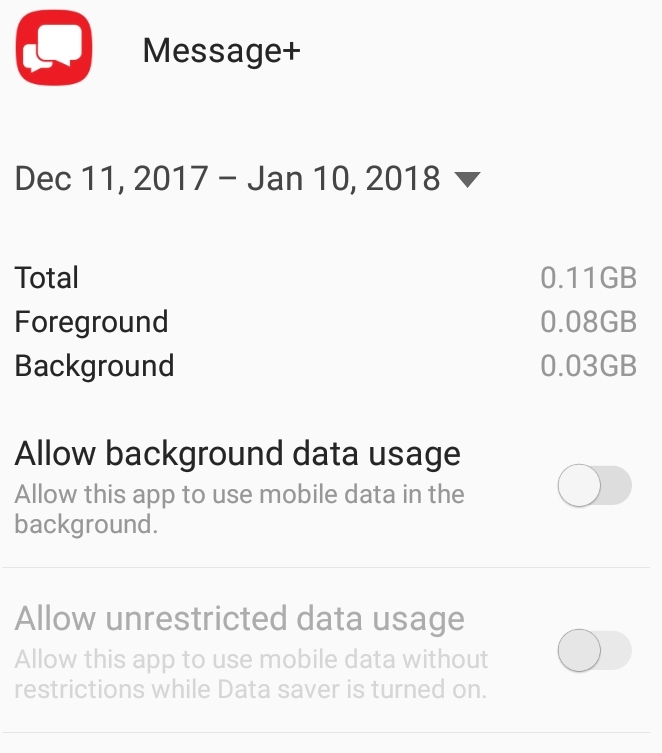 I am using the Samsung message app and sending the same kind of text messages that I was with Message+ and have not seen an increase in data usage. As I stated previously, I was not sending ANY messages at the time when it used over 400MB of data. I have not been using Glympse or any other messaging service and the types of texts/pictures I've been sending have not changed from previous months, but the amount of data being used has skyrocketed from around 100MB/month to over 4GB/month. If I hadn't had extra data rolled over from last month then it would have used up ALL my data and I would have had to buy more. I know that the most obvious answer is just that we're using the app more or we've been sending pictures/videos larger than 5MB, but we are not. There is an issue with the app that is causing it to use too much data and I'm sure there are other people experiencing similar issues that are unaware it is even happening if they have unlimited data plans. We appreciate the time you've taken to troubleshoot this data usage issue with us, RELL8891. This definitely is a concern, and is something that we do have a path in place to fix. If you go to Messages +, and choose the menu bars in the upper left corner of the application, there is an option in the fly-out menu to 'Report a Bug'. Getting this concern up to the application developer will allow us to work with them to get to the bottom of what's causing this usage.